The tablet era has just begun, but Forrester Research is already predicting tablet sales in the U.S. will overtake netbook sales by 2012, and desktop sales by 2015. At the Untethered conference today in New York City, Forrester analyst Sarah Rotman Epps laid out her projections comparing tablet sales to netbooks, laptops, and desktops. She expects 3.5 million tablets (including the iPad and other tablets) to be sold this year, growing to 20.4 million in 2015. Meanwhile, she expects desktop sales to drop from 18.7 million units in 2010 to 15.7 million units in 2015. 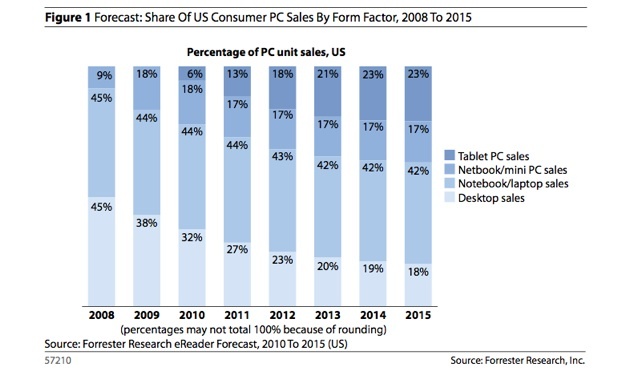 As a percentage of overall PC sales, tablets will grow from 6 percent this year to 18 percent in 2012 (when netbooks are estimated to account for 17 percent of sales. The next year, in 2013, tablet sales are projected to outstrip desktop unit sales, 21 percent to 20 percent. By 2015, tablets will make up 23 percent of PC sales in the U.S., while desktops will be 18 percent and netbooks will be 17 percent. Only laptops will sell more in the U.S., with a 42 percent market share. The big question is how much of the tablet market can Apple capture? It has already sold 2 million iPads, and could easily blow past Forrester’s 3.5 million estimate for this year all by itself. It is not stretch for it to get to 20 million by 2015 either. So is there room in this market for other tablets, or will Forrester need to increase its estimates? These projections are for unit sales, not total revenues, but still the expectation that there will be more tablets sold in five years than any other type of computer is stunning. By 2015, the cumulative number of people using tablets will be 59 million, according to Rotman, which will be larger than the installed base of netbooks (but still just a fraction of the installed base of desktops and laptops). On a global basis, IDC also sees tablets and e-readers driving more growth than netbooks. Looks like it is time to stick a fork in netbooks.